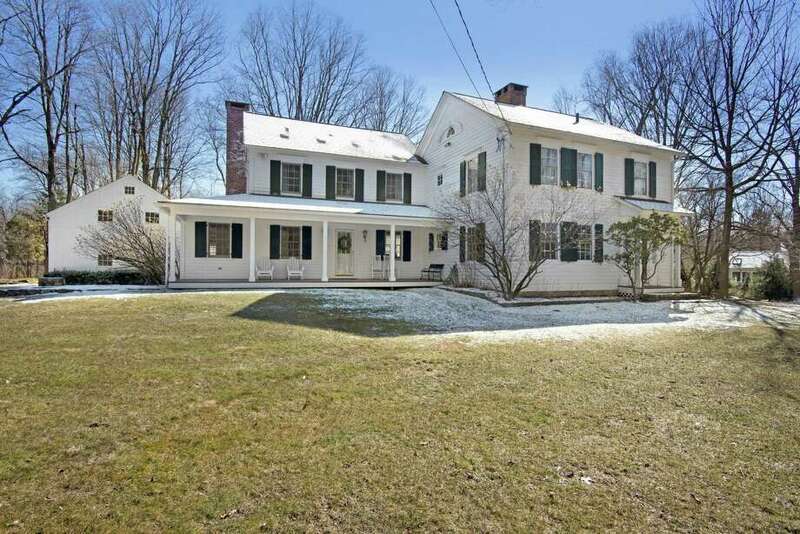 The updated antique colonial farmhouse at 87 Partrick Road was built in 1823 by Lewis Partrick, one of Westport’s founding fathers. WESTPORT — The sense of Westport’s early history is palpable in the newly painted, updated antique colonial farmhouse at 87 Partrick Road in the town’s Old Hill neighborhood. And yet, the restoration and expansion of this house was so masterfully and purposefully done that the structure works perfectly within the parameters of modern-era living and entertaining. “It says a lot about how we were able to seamlessly blend the old and new parts of the house by using authentic materials. It’s hard to tell where the old part ends and the new part begins,” said Mary Alice Kelly, one of the homeowners. Imagine walking in the footsteps of one of Westport’s founding fathers without sacrificing modern amenities. This white clapboard house was built on what was a large onion farm in 1823 by Lewis Partrick, whose signature is included on the town charter. Westport was incorporated in 1835. Partrick built the “half colonial” house — meaning it only had one instead of two front parlors — for his new bride, Mary Nash, who was also from a prominent Westport family. Does Nash Pond sound familiar? Some of the original 19th-century details remain, including the flooring, exposed beams and five fireplaces — most with original mantels, although the house was reconfigured. What had been the original kitchen is now a sitting room. What had been the original birthing room on the second floor is now a laundry room. According to Kelly, there is a rumor that this house was a safe stop for slaves traveling on the Underground Railroad. She said there is an unusual closet in that laundry room that goes under the eaves. To this house, a small galley kitchen and maids quarters were added in the 1920s. The current owners added substantially to the house in 1998, expanding the footprint to 4,370 square feet and dramatically increasing the size of its now gourmet kitchen. That is also when they added the wide covered front porch and installed a vintage barn, which now serves as the home’s oversized two-car garage, workshop, and artist’s studio. They purchased the dilapidated 1850’s barn from a property in Bethel. Its chestnut beams and other components were numbered as the barn was dismantled to aid in the reconstruction on the Westport property. “We had a real barn-raising,” Kelly said. During that major renovation, Kelly said every original window pane was removed, re-glazed, and placed back in their sills. The shelves and cabinets were constructed of reclaimed old wood and adorned with authentic period hardware. In some rooms, the original wide-planked, pumpkin pine floors were pulled up and refurbished, subflooring was set down, and the original floors were re-installed. “It really was a labor of love. We tried to make it as authentic as possible,” she said. The house is set back from the road, which is unusual for a house of this vintage. A fieldstone wall lines one side of the driveway, which leads to the barn and front porch. Inside, the formal dining room has a fireplace and built-in china cabinet. The chef’s kitchen contains two porcelain farm sinks, Carrara marble counters with Ogee edges, additional counter space topped in wood, a center island, built-in window seat, and built-in desk area. High-end appliances include a stainless Sub-Zero refrigerator and a Viking Professional range with double ovens. French doors lead to a screened porch with slate flooring. The breakfast room has a fireplace. The mudroom connects the living space to the oversized barn/garage. It doubles as wet bar and refreshment outpost. There is another area in this part of the house that could also be used as a potting or garden shed. On the second floor there are three bedrooms, including the inn-inspired master suite, which features a marble fireplace and built-in bookshelves. The finished attic has flexible space as the fourth bedroom, home office or separate au pair/in-law accommodations. Outside, the property has a lightly wooded yard with a stone patio, stone walls, and a stream that runs through one side of it. Beyond the property is Earthplace nature center to which residents of this house can walk. “My daughters went to Earthplace from the time they were 2 years old. They know every tree and every trail there,” Kelly said. They also played in the stream and loved to catch frogs, she said. There will be a public open house on March 31 from 1 to 3 p.m.